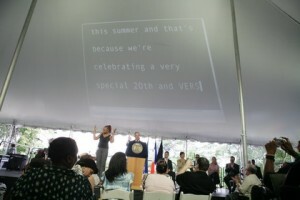 Last night at Gracie Mansion, New York City Mayor Michael Bloomberg held an event to celebrate the 20th Anniversary of the Americans with Disabilities Act. I accepted an award on behalf of The AbleGamers Foundation, of which I am a board member. (Congrats, AbleGamers!!) While sitting up on stage as the Mayor gave his speech, I looked around the room for CART services. Figuring they didn’t offer CART, I tried to follow the sign-language interpreter. About halfway into the program I happened to look up: CART was on the ceiling!! 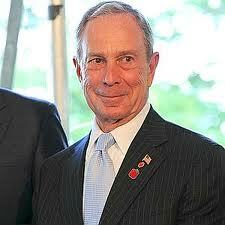 I must have looked terribly foolish stretching my neck to read the Mayor’s words upside down. But I don’t think he noticed. Here are the five recipients of the disability awards, which are given out based on the category — known as a title — of the ADA that they have helped advance. Bank of America was honored for its commitment to diversity and inclusion in its everyday activities such as charitable giving to organizations aiding those with disabilities, promotion and encouragement of internal volunteer-based affinity groups, and recruitment of diverse talent including its job accommodations group that integrates people with disabilities and arranges accommodations. Bob Qutub, Chief Financial Officer, Global Banking and Markets, Bank of America, accepted the award. The American Museum of Natural History was honored with the Title II Public Service Award for its accessible exhibitions, theaters, and food service areas, as well as its Science Sense tours, which are geared for the blind and visually impaired, are free with admission and involve specially trained museum tour guides who highlight specific themes and exhibition halls while engaging participants through extensive verbal descriptions and touchable objects. Ann Siegel, Vice President for Operations and Capital Programs, American Museum of Natural History, accepted the award. The New York City Independent Living Centers was honored for providing a wide array of services to people with disabilities free of charge, including benefits counseling, housing assistance, employment-related assistance, healthcare access, skills training, recreational activities and more. Robert Gumson, Unit Manager, Independent Living Services, New York State Education Department’s Office of Vocational and Educational Services for Individuals With Disabilities (VESID), accepted the award. The AbleGamers Foundation was honored with the Title IV Telecommunications award for its use of technology and accessible telecommunications, including its website, AbleGamers.com; its annual “Game Accessibility Day“, its interactive event “The Accessibility Arcade” that allows non-disabled people to look at, and experience the gaming world from the perspective of the disabled; and its “Path to Games Accessibility Project.” Suzanne Robitaille, Board Member, The AbleGamers Foundation, accepted the award. Autism Speaks, a nonprofit corporation that funds research into the causes, prevention, treatments and a cure for autism, was honored with the Frieda Zames Advocacy Award, given to an individual or organization whose efforts for greater accessibility are a fitting tribute to the late Frieda Zames. Autism Speaks’ annual “Walk Now for Autism Speaks” event in New York City raised over $1 million and involved the participation of over 4,700 walkers. Mark Roithmayr, President, Autism Speaks, accepted the award. So awards were given to 4 entities for empowering people with disabilities, and to 1 entity for using pity and stereotypes to raise money? Not supplying a CART feed to someone onstage who needs it when the audience is able to read it is a big pet peeve of mine. At the very least, they should have given you a portable computer with the realtime output mirrored on it that you could have put on the table where you were sitting.